Their ninth album, Integrity Blues, is one of the deepest yet in terms of subject matter. After taking a year out from band duties, during which time bassist Rick Burch discovered a passion for distilling, and drummer Zach Lind self-released music with his wife, the band realised their next album had to be a meaningful snapshot of the stage they were all at in life. Integrity Blues was born, marking the start of a new, grown-up chapter for Jimmy Eat World. We sat down with the band to find out more. You’ve talked about this album being about accepting life and the changed it throws at you. What made you want to write something that philosophical? When you first started writing the record, did you make a conscious decision to talk about things like that? Was it quite a collaborative writing effort? Are there any particular songs that he really brought to life? Are there any songs that went through a total rework from what they began life as? Get Right has been called the ‘comeback track’. Do you see it that way? Now your tour dates have been announced, which songs are you looking forward to performing live? 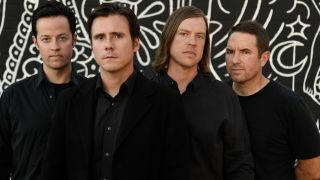 Jimmy Eat World release Integrity Blues on October 21 through RCA. The band begin their tour on October 1.